Wars have become economic in nature and maybe they always were. The Soviet Union could not sustain the expense of keeping up with the United States military budget, and collapsed. No bombs were dropped; there were no boots on the ground, but the Soviet Union lost the war. It was dismantled as surely as any nation who has fallen to a conqueror. According to Nobel Prize winner James Stiglitz, the war in Iraq cost the United States, $3 trillion—and counting. The war in Afghanistan, plus all the “non-wars” in Libya, the Yemen, and on Pakistan’s border (with Syria on the brink) have cost the United States another $1 trillion—and counting. President Bush inherited a $128 billion budget surplus from Bill Clinton and a national debt of only $5.6 trillion. During the Bush administration, the national debt increased by more than 65 percent, to over $10 trillion—so much for Republican fiscal responsibility. The Iraq war, at $3 trillion, exceeded by sixty times the Bush administration’s initial estimate of a mere $50 to $60 billion—which neocon Paul Wolfowitz claimed would be easily paid for by Iraq’s oil revenues. 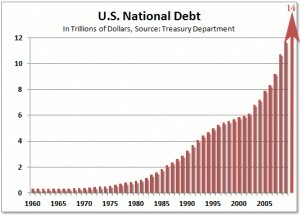 Without the wars caused by Al-Qaeda, the U.S. national debt would now stand at around $10 trillion. Instead, the United States is on the brink of default and disaster with a crushing national debt of $14 trillion—$46,000 for every man, woman, and child in the United States. Of the $14 trillion, the $4 trillion worth of economic damage caused by Al-Qaeda lays a financial burden of $12,389 on every American. Al-Qaeda accounts for 28% of the United States national debt—and counting. Moreover, this debt has crippled the American government, which is now concerned only with the national debt, and the debt ceiling. Both the Democrats and the Republicans are proposing cuts in Medicare, Medicaid and Social Security, the so-called entitlements. Let Main Street pay. No mention is made of cutting the cost of all the wars. In fact, under the Bush-Obama doctrine, new wars are emerging as the United States seeks to impose its will on one country after another at great expense to the American people—and with little or no success. Al-Qaeda’s imposing of a $4 trillion debt on the United States begs an important question: Has Al-Qaeda defeated the United States? 2 comments to Has Al-Qaeda Defeated the United States? It’s all for the BIG BUSINESS people, the defence contractors, they are in this budget package. I hope our country will stay out of Syria, and NOT help bail out Greece? I enjoy your posts, John. Just ordered your book, Escape from Paradise, and am looking fw to reading it! Michael: You are absolutely right – it is all for big business. Glad you enjoy my posts, and my wife and I thank you for buying a copy of our book. We hope you enjoy it, and let us know what you think.